· 3.4 - Lessons from the Ice Ages? 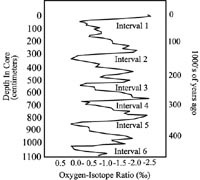 Sawtooth cycles from Broecker and van Donk, showing core depth & age versus oxygen isotope ratio. Note how graph shows that during ice age intervals the buildup is slow and jagged while the end is abrupt. What did the climatic environment during the evolution of mammoth and people really look like? Clearly, this question can only be answered by studying the deep-sea record and understanding the role of the ocean in climate change. By the early 1960�s Milankovitch's theory had received a boost from the striking cyclic patterns of the ocean record, but acceptance was stalled. The chief reason for the prevailing skepticism was the lack of a precise time scale, which would make it possible to test the match between the cycles recorded in the sediments and the Milankovitch cycles calculated on the basis of the Earth's orbit and rotation. In the late 1950�s and early 1960�s, new dating methods emerged based on the radioactive decay of the elements thorium and uranium. These could be applied to sediments much older than those that could be dated by the radiocarbon method introduced in the 1940�s. The new methods proved useful in assigning ages to uplifted corals on islands in the Caribbean and the Pacific, like Barbados and New Guinea, where older coral reefs are laid bare on the rising slopes. Most of these exposed reef masses grew during times of maximum sea level stand, when the ice sheet volumes were at a minimum, and they can be identified on the seaward slopes of islands, sampled, and dated, thus yielding a series of ages corresponding to times of high sea level. Such work was undertaken at Lamont, by Wallace Broecker and his student David Thurber, and at SIO, by Hans Herbert Veeh, Ed Goldberg�s student, showing that the last maximum sea-level stand was 120 - 124 kiloyears ago. In 1966, Broecker proposed a new time scale based on extrapolation of a 120,000-year date for the last major warm peak in the oxygen-isotope record, and he proclaimed his data was a close match to Milankovitch summer insolation. He also introduced the notion of a "mode switch" in ocean circulation from a warm to a cold state. A few years later in 1970, Broecker and his student Jan van Donk elaborated on the "mode switch" theme and postulated rapid transitions from periods of maximum glaciation to the following warm periods. They identified 6 such "terminations" for the last 440,000 years, which define 5 full cycles for the last 400,000 years, for an average duration of 80,000 years per cycle. With this work, Broecker introduced the notion that the major ice age cycles of the Pleistocene were roughly 100,000 years long, and that glaciations grew gradually and ended abruptly, a pattern described as "sawtooth" cycles. Concerning our theme for this section, mammoth extinction and ice ages, it is clear that the concept of ice age terminations is of the utmost importance. It suggests that the abrupt climate change occurs during destruction of ice sheets, rather than during buildup (as originally hypothesized by Agassiz). Thus, if climate was important in governing population sizes of the Pleistocene megafauna (as seems reasonable) then the times of rapid ice decay were perhaps the most stressful and dangerous for survival. The question of dating was greatly advanced by using magnetic stratigraphy to date a deep-sea core from the western tropical Pacific, a technique first established in 1964. Magnetic stratigraphy allows a geologist to date a rock or sediment by looking at the magnetic signal imprinted into it by virtue of the fact that Earth�s magnetic field periodically reverses. This discovery was put to good use in dating a large suite of cores from the Lamont's core library, and soon after, James Hays, a paleoceanographer at Lamont, had the splendid idea to tie oxygen-isotope fluctuations to magnetic reversal stratigraphy. He sent samples from a core that had been dated using the new paleomagnetic method off for isotopic analysis by Nick Shackleton (later Sir Nicholas) in Cambridge, England. The result could not have been more significant. The first distinct magnetic reversal of the core, called the "Brunhes-Matuyama" reversal, was found to occur just before Isotope Stage 19, the 19th warm peak (counting the present peak as Number 1). The reversal had been dated (on land) as about 700,000 years before present. It was now possible to assign ages to each isotope stage, by interpolation. Stage 5e came out near 123,500 years. Bingo! A time scale was now available for the entire period for which Milankovitch had made his calculations. The dated signals now became "time series," analogous to an oceanographer�s tidal records. Such time series are routinely subjected by engineers and physicists to "spectral analysis," a technique invented by the eminent French mathematician Jean Baptiste Joseph Fourier (1768-1830). Fourier showed how any time series can be represented as a sum of sinusoidal fluctuations (the Sines, Cosines and Tangents of trigonometry). When analyzing a series by the Fourier method, it emerges that some cycles stand out. Thus, �Fourier analysis� allows the identification of those cycles that are most important in a given time series. When Fourier analysis was applied to deep-sea records in 1975, it emerged that the oxygen-isotope series contained strong cycles with periods near 100,000 years, 41,000 years, and 23,000 years. These are precisely the periods expected if Earth's orbital elements (eccentricity, obliquity, and precession) govern ice-age climates, as proposed by Milankovitch Theory. Thus, there could be no more doubt that orbital elements had to be considered as important drivers of climate on long time scales. The following years saw a profusion of information and discussion on this subject. A revolution in thought was being made, and our understanding of Earth history would never be the same. The orbit-climate connection squarely puts Earth's climate into the context of the fluctuating gravitational field of the solar system. The planets wandering across the heavens may not control our individual lives, as once thought during the early days of astronomy, but they do control the course of large-scale climate fluctuations which form the backdrop for the evolution of the ice-age megafauna and for our own species.